It’s great to see the former location of the Old Bath House open up as the new Beach House Restaurant at Lover’s Point, Pacific Grove. There were a few delays that push back the opening date several months but I’m glad they endured the setbacks and opened a beautiful restaurant with amazing views. If you haven’t dined at the Beach House, you are missing out. They offer a diverse menu, very nice ambiance, great service, full bar, and views views views. This is the way to dine. One can choose from escargot to oysters on the appetizer menu and from burgers to lobster tail from the entrée menu. They also have an astounding sunset dinner (early bird dinner). I’m happy to see such entrees like sole, meatloaf, chicken, salmon, and pork loin for under $10. But you have to order before 6:00. They have seating out on the glass enclosed deck with heat lamps, as well as the bar, or in the main dining area. The owners Kevin Phillips and Jim Gilbert did it again. They have the golden touch. They also own Gilbert’s Restaurant and Abalonetti’s both on Fisherman’s Wharf, Monterey. To have a successful restaurant, one must operate on all cylinders all the time. The staff is so important from the kitchen to the wait staff to the bussers to the host to the bartenders, and of course management. Which leads me to Jeremy Phillips the general manager. He is a young and ambitious man with lots of drive. He is 29 years old with 15 years experience in the restaurant business and has been around it his whole life. His dad is the co-owner. Jeremy has worked at many local establishments gathering a wealth of knowledge and experience from some of the greats like; Bill Lee, John Pisto, Coastal Luxury Management, and of course his father Kevin Phillips and his partner Jim Gilbert. Jeremy spent some time at Cal Poly studying business, but his passion for food, beer, and wine could not be surpassed. He is Cicerone certified and is currently moving towards sommelier certification. A Cicerone is a person who has been chosen to designate those with proven expertise in selecting, acquiring and serving today’s wide range of beers. Thus, Jeremy can pair beer with your entrée as a sommelier would with food and wine. This is his first position as a general manager and he loves the challenges and rewards of running a new and feverish restaurant. Please visit him and his staff soon. Call 831-375-2345 for reservations or visit www.beachhousepg.com for more info. They are open at 4:00 daily. Seared scallops with lobster bisque sauce. Using a large pot, render bacon over medium heat until crisp. Remove bacon from pan and set aside for garnish. Sautee tails and shells in olive oil until heated through. Sprinkle with 1 Tbsp. of flour. Add carrot and onion and sauté together over medium heat until shells have turned in color and vegetables have softened. Carefully add the cognac and reduce until alcohol is mostly absorbed. Add water and tomato puree and simmer to reduce again. After 5-6 minutes of simmering, add heavy cream and sugar and continue to reduce for several minutes. Once the bisque is hot, remove from heat and allow it to cool slightly. Using a food processor, pulse the shells and vegetables slightly, adding lemon juice for flavor, if desired. Pass through a fine mesh strainer and back into pot. Season with salt and pepper. Return to low heat to keep warm. Remove side muscle from each scallop and pat dry. Season lightly with salt and pepper, and bring a small sauté pan to high heat (using olive or grape seed oil). Once oil is hot, carefully place each scallop into pan and sauté 1-2 minutes until browned evenly on both sides and cooked to desired texture. Ladle bisque into a bowl and arrange the scallops evenly on the bottom. Scatter bacon pieces and top with parsley or chervil. Chefs Briana Sammut and Guillaurme D’Angio are the dynamic duo in the kitchen creating the delicious cuisine at the Beach House. Briana was the pastry chef at Crema, also of Pacific Grove, and Guillaurme was the sous chef at Cantinetta Luca located in Carmel. Now they run the kitchen as co-executive chefs creating culinary delights for all of us to enjoy. Briana is a graduate of the Culinary Institute of America in New York and Guillaurme attended Poitiers Culinary Academy in France. I feel their backgrounds and heritage adds a nice flare to the delightful epicurean inspirations they produce. The above recipe was brought to you by Briana and is being featured at the Beach House. I’ve had the pleasure of pairing several of her creations in the past and am looking forward to many more. She is pleasant to work with and creates amazing palette pleasing gastronomic fare. Please visit them soon and taste their culinary skills. 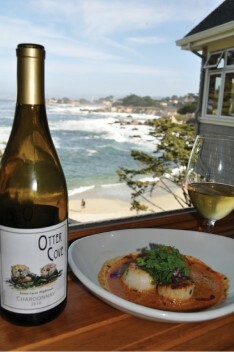 2010 Otter Cove Chardonnay, Santa Lucia Highlands, Monterey. This is a single vineyard from Paraiso Wines. It started in stainless steel then aged in neutral oak. It went through partial malolactic fermentation. You’ll get butter up front, tropical fruits in the mid palette, with a hint of vanilla on the finish. It’s a nice refreshing wine that pairs great with many different seafood items. The Beach House offers the Otter Cove Chardonnay, Pinot Noir and the Syrah to pair with many of the wonderful menu selection or to sip while enjoying the breathtaking views. Topics: Oh, Have A Taste!